1806~1825: born in Ôsaka in the district of Shinbori. His father is the owner of a tea house called Edogen. He starts his career at an early age, playing under the name of Nakamura Genji in the children-actors troupe led by Nakamura Tôtarô. They perform mainly in the precincts of temples and shrines (miyaji shibai). 3rd lunar month of 1826: Genji settles in Edo and takes the name of Nakamura Shibazô I at the Nakamuraza, playing in the dramas "Sanmon Gosan no Kiri" and "Hatsu Yagura Yayoi no Kotobuki". 11th lunar month of 1829: premiere at the Nakamuraza of Tsuruya Nanboku IV's drama "Kin no Zai Sarushima Dairi"; Shibazô plays the role of Izawa Yakurô [more details]. 1834: Shibazô goes back to Kamigata. 3rd lunar month of 1845: Shibazô plays at the Chikugo no Shibai the role of Motoemon in the drama "Ehon Tengajaya-mura". His stage partners are Nakamura Shikan III (Hayase Iori), Arashi Rikaku II (Yasuke), Sawamura Kitô (Somenoi) and Kataoka Ichizô I (Tôma Saburôemon). 1st lunar month of 1847: Nakamura Shibazô I takes the name of Nakamura Gizaemon at the Chikugo no Shibai. Spring 1851: Nakamura Gizaemon takes the name of Nakamura Jakuemon I in Nagoya at the Wakamiya no Shibai. 11th lunar month of 1851: official shûmei in Ôsaka at the Naka no Shibai; Jakuemon plays the roles of Kurosuke and Hida Saemon in the classic "Genpei Nunobiki no Taki". 8th lunar month of 1854: Jakuemon achieves a great success in Kyôto at the Kitagawa no Shibai by playing the role of Rôikkan in Chikamatsu Monzaemon's drama "Kokusen'ya Gassen". 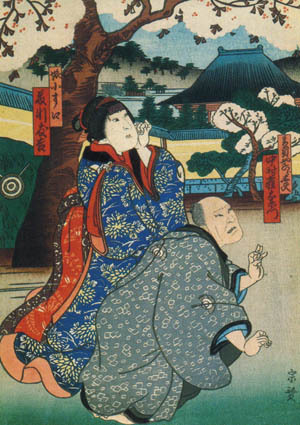 Spring 1860: Jakuemon becomes zagashira at the Chikugo no Shibai; he successfully produces the drama "Hime Kurabe Futaba Ezôji". 6th ~ 7th lunar months of 1860: tour in Miyajima with Bandô Kamezô I, Bandô Hikosaburô V, Fujikawa Tomokichi III and Ôtani Tomomatsu; Jakuemon plays the role of Nikki Danjô in "Meiboku Sendai Hagi". 9th lunar month of 1864: Jakuemon plays at the Naka no Shibai the roles of Kakogawa Honzô, Yakushiji Jirozaemon and Ono Sadakurô in the classic "Kanadehon Chûshingura". His stage partners are Arashi Kichisaburô III, Jitsukawa Enzaburô I, Ogino Senjo and Arashi Hinasuke VI. 1866: Jakuemon's rank in the Kamigata hyôbanki, jitsuaku/katakiyaku section, is dai-jô-jô-kichi (grand - superior - superior - excellent). 9th lunar month of 1870: Jakuemon plays at the Naka no Shibai the roles of Yazaemon ("Sushiya") and Yokawa no Zenji Kakuhan in the classic "Yoshitsune Senbon Zakura". 5th lunar month of 1871: Jakuemon appears on stage for the last time, in Ôsaka at the Takeda no Shibai, playing the roles of Wada no Hyôe Hidemori and Magoemon in the jidaimono "Ômi Genji Senjin Yakata" and the sewamono "Koi Bikyaku Yamato Ôrai"; he dies in the 8th lunar month of 1871 and his tombstone is located in Ôsaka in the precinct of the Yûkôji temple in the district of Shimoteramachi. Nakamura Jakuemon I was a great and popular Kamigata actor, who excelled in katakiyaku and jitsuaku roles. He was also at the end of his career an outstanding oyajigata.